Chairman Neal, Ranking Member Brady, and members of the committee, thank you for the opportunity to testify today on rising inequality in the United States. My name is Elise Gould and I am an economist at the Economic Policy Institute (EPI) in Washington, D.C. EPI is a nonprofit, nonpartisan think tank that believes every working person deserves a good job with fair pay, affordable health care, and retirement security. To achieve this goal, EPI conducts research and analysis on the economic status of working America. I am an economist with particular expertise on wages and wage inequality. My testimony establishes that the poor performance of American workers’ wages in recent decades—particularly the failure of workers’ wages to grow at anywhere near the pace of overall productivity—is one of the country’s central economic challenges. Indeed, it’s hard to think of a more important economic development in recent decades. It is at the root of the large rise in overall income inequality that has attracted so much attention in recent years. A range of other economic challenges—reducing poverty, increasing mobility, closing racial and gender wage gaps, and spurring a more complete recovery from the Great Recession—also rely largely on boosting hourly wage growth for the vast majority. Income inequality is the primary reason why the vast majority of Americans experienced disappointing growth in their living standards over the last four decades. In other words, most Americans are seeing slow income growth because most of overall income growth is going to households at the top. Labor market income represents the largest source of income for most Americans and that is why we cannot tackle income inequality without tackling wage growth. Wage growth in the last four decades has been uneven, with notable growth only at the top while wages for most workers have failed to rise with productivity growth. This uneven wage growth—what we can call growing wage inequality—continued through the 2000s, as wage gaps between demographic groups persisted, and, in some cases, worsened. Further, the growth in inequality cannot be explained by growing demand for college-educated workers. Recent wage gains for the lowest wage workers can be explained by tight labor markets and the institution of a number of state-level minimum wage increases. Going forward, policymakers should prioritize keeping labor markets tight while also strengthening institutions and policies that provide workers the leverage they will need to achieve decent wage growth even when the economy is not at full employment. These policies and institutions include strengthening and enforcing labor standards, making it easier for workers to collectively bargain, and raising the federal minimum wage. In recent decades, the vast majority of Americans have experienced disappointing growth in their living standards—despite economic growth that could have easily generated faster gains in their living standards had it been broadly shared. 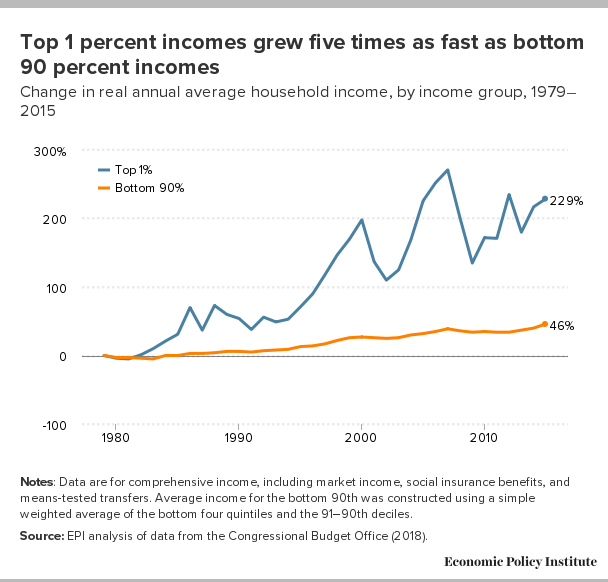 Figure A helps us assess the economic performance for different groups by charting the cumulative percentage increase in household income for the top 1 percent compared with the bottom 90 percent. Breaking the top 1 percent down even further would show nearly as dramatic an increase in inequality just within this top group, but it would also stretch the vertical axis so much as to make it nearly unreadable. What this shows is that income grew swiftly for a small sliver of the population while living standards for most grew far more slowly. Figure A measures the change in comprehensive income—including cash, market-based incomes (wages and salaries, dividends, rent, capital gains, and business income); noncash income, such as employer contributions to health insurance premiums; and cash and noncash government transfers like Social Security, food stamps, Medicare, and Medicaid. It is easy to see that the rise in American inequality is extreme even when using these comprehensive income measures, which include taxes and transfers. One striking aspect of the figure is the large decline in top 1 percent incomes following the onset of the Great Recession after 2007. However, a similarly large fall in top 1 percent incomes resulted from stock market declines following the 2001 recession as well, and as the figure shows, as of 2015, these incomes mostly recovered. Even with these losses, the top 1 percent of household income has grown 229 percent since 1979, far in excess of the slower 46 percent growth—just 1.0 percent annualized growth—for the bottom 90 percent of households. Notes: Data are for comprehensive income, including market income, social insurance benefits, and means-tested transfers. Average income for the bottom 90th was constructed using a simple weighted average of the bottom four quintiles and the 91–90th deciles. Source: EPI analysis of data from the Congressional Budget Office (2018). Among the bottom 90 percent of American households, labor income—including wages and wage-related income such as employer contributions to health insurance benefits for workers and Social Security and Medicare for retired workers—represents the vast majority of income. 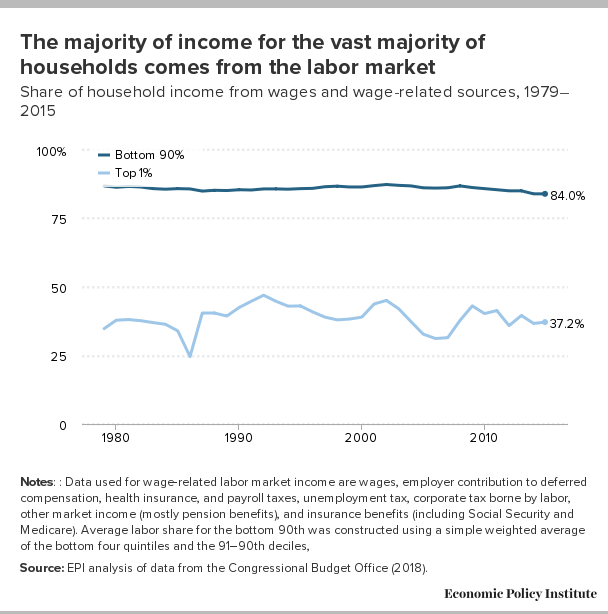 Figure B illustrates the share of total income that is composed of wages and wage-related incomes for the bottom 90 percent and the top 1 percent of household incomes. What’s clear from the figure is that the vast majority of American households get the vast majority of their incomes from wages and wage-related sources while a much smaller share of incomes for the top 1 percent comes from these sources. Over the entire period, contributions of wages and wage-related income for the top 1 percent averaged just under 40 percent, while it averaged 86 percent for the bottom 90 percent of households, more than twice as high. In 1979, 86.9 percent of household income for the bottom 90 percent came from wages and wage-related sources. By 2015, the share had fallen slightly to 84.0 percent. Over this period, much of the rise in earnings for most households came from increasing work hours and not increasing hourly wages (Bivens et al. 2014). Because the vast majority of household income for the bottom 90 percent comes from labor income, it is clear that growing wage inequality is at the root of slow growing incomes for the vast majority of American households. Because wages are their primary source of income, the rise in income inequality that has blocked living standards growth for the vast majority since 1979 has been driven by a pronounced reduction in the collective and individual bargaining power of ordinary American workers. As a result of their eroded bargaining power, their wages have grown agonizingly slow over the past generation. 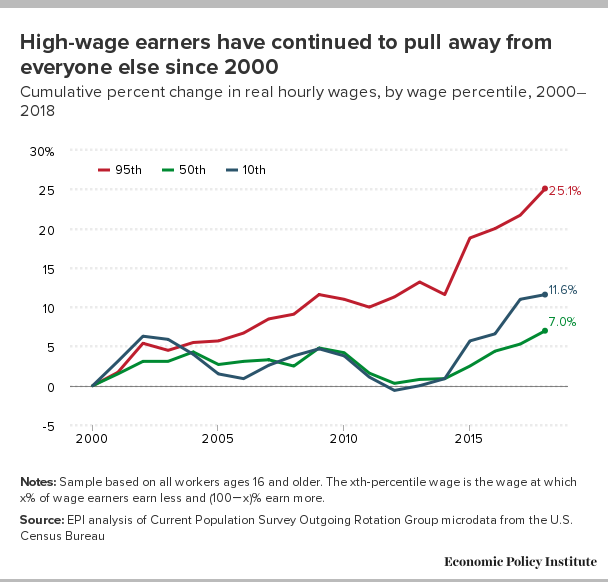 Rising wage inequality—anemic wage growth for the vast majority, combined with substantial wage gains for those at the very top—has left most Americans with an ever-shrinking portion of the overall wage bill. It is also the case that if labor incomes—i.e., wages—had not grown so unequally, then the share of total output available to be claimed by capital owners, again concentrated at the top of the income distribution, would have been significantly smaller. It is the combination of these two factors—driven by wages for the vast majority lagging productivity—that has led to the erosion of most Americans’ living standards. The resulting lackluster wage growth and inequality have afflicted men and women, and people at all levels of education; even the college educated are just treading water. 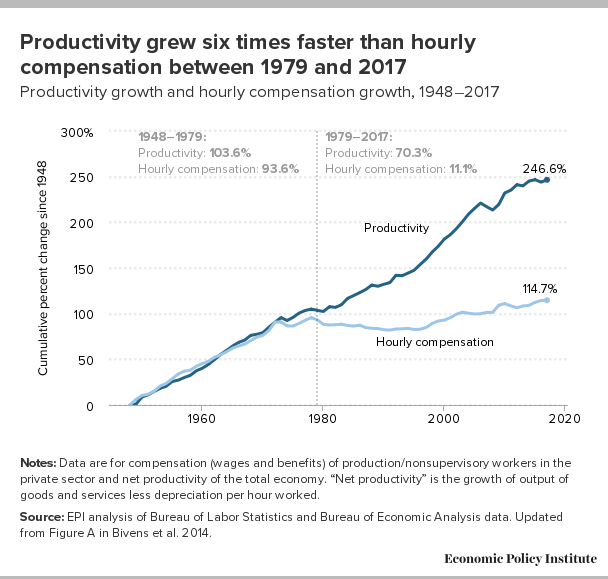 Figure C demonstrates that since 1979, “real” (inflation-adjusted) hourly pay for the vast majority of American workers has diverged from economy-wide productivity. After tracking rather closely in the three decades following World War II, growing productivity and typical worker compensation diverged. From 1979 to 2017, productivity grew 70.3 percent, while hourly compensation of production and nonsupervisory workers grew just 11.1 percent. Productivity thus grew six times faster than typical worker compensation. Notes: Data are for compensation (wages and benefits) of production/nonsupervisory workers in the private sector and net productivity of the total economy. “Net productivity” is the growth of output of goods and services less depreciation per hour worked. Source: EPI analysis of Bureau of Labor Statistics and Bureau of Economic Analysis data. Updated from Figure A in Bivens et al. 2014. EPI analysis of unpublished Total Economy Productivity data from Bureau of Labor Statistics (BLS) Labor Productivity and Costs program, wage data from the BLS Current Employment Statistics, BLS Employment Cost Trends, BLS Consumer Price Index, and Bureau of Economic Analysis National Income and Product Accounts. Updated from Figure A in Raising America’s Pay: Why It’s Our Central Economic Policy Challenge, by Josh Bivens, Elise Gould, Lawrence Mishel, and Heidi Shierholz, Economic Policy Institute, 2014. A natural question that arises from this story is just where did the “excess” productivity go? A significant portion of it went to higher corporate profits and increased income accruing to capital and business owners (Bivens et al. 2014). But much of it went to those at the very top of the wage distribution, as shown in Figure D. The top 1 percent of earners saw cumulative gains in annual wages of 157.3 percent between 1979 and 2017—far in excess of economywide productivity growth and nearly four times faster than average wage growth (40.1 percent, not shown). Over the same period, top 0.1 percent earnings grew 343.2 percent, with the latest spike reflecting the sharp increase in executive compensation (Mishel and Wolfe 2018). Over the same period, despite a growing economy and increases in productivity, the earnings for the bottom 90 percent only rose 22.2 percent. It’s important to remember this disparity. When policymakers consider policies to improve productivity growth, they also should consider ways that growth could better translate into wage growth for most workers and not just for those at the very top. While the CPS-ORG—the primary data set used in the remainder of this testimony—does not allow disaggregation within the top 5 percent of the earnings distribution, it is still instructive for measuring the growth in wage inequality over the last 40-odd years. Figure E illustrates that for all but the highest earners, hourly wage growth has been weak. If it hadn’t been for a period of strong across-the-board wage growth in the late 1990s, wages for most would have fallen outright. Median hourly wages rose 14.0 percent between 1979 and 2018, compared with an increase of 4.1 percent for the 10th-percentile worker (i.e., the worker who earns more than only 10 percent of workers). Over the same period, the 95th-percentile worker saw growth of 56.1 percent. Notes: Shaded areas denote recessions. The xth-percentile wage is the wage at which x% of wage earners earn less and (100−x)% earn more. Figure F illustrates the trends in wages for select deciles (and the 95th percentile), showing the cumulative percent change in real hourly wages from 2000 to 2018. The continuing overall story of inequality is clear. From 2000 to 2018, the 95th-percentile wage grew over three times as fast as wages at the median. Additional details on recent wage trends can be found in Gould 2019a, also submitted into the written record. During this period, wage inequality among men grew more than wage inequality among women, and the gap between men and women at the top continued to widen in part because men are more likely to occupy jobs at the top of the wage distribution. Black–white wage gaps also widened between 2000 and 2018 as white wages grew more than four times as fast as black wages across most of the wage distribution (Gould 2019b). Steep and rising wage inequality is too often blamed on growing demand for workers with higher levels of educational attainment—the more schooling you have, the more you’ll be paid, the theory goes. But research has shown that rising inequality cannot be explained by rising wages for those with more educational attainment. The more salient story between 2000 and 2018 is not one of a growing differential of wages between college and high school graduates, but one of growing wage inequality between the top relative to the vast majority of workers, as shown in Figure F. Wage inequality is driven by changes within education groups (among people with the same education) and not between education groups. Among college graduates, there has been a significant pulling away at the very top of the wage distribution. In fact, the bottom 60 percent of workers with a college degree still have lower wages than they did in 2000 (Gould 2019c). Increases in inequality over the last 18 years clearly cannot be explained away by claims that employers face a growing shortage of college graduates and that, correspondingly, wage inequality is some unfortunate side effect of the positive gains from automation that we neither can nor would want to alter. There are plenty of good reasons to provide widespread access to college educations and skill development, but expanding college enrollment and graduation is not an answer to escalating wage inequality. Notes: Sample based on all workers ages 16 and older. The xth-percentile wage is the wage at which x% of wage earners earn less and (100−x)% earn more. After years of wage losses, the lowest-wage workers finally exceeded their 1979 wage levels in 2017 (as shown in Figure E.) These recent wage gains can essentially be fully explained by tight labor markets and state-level minimum wage increases. Because the lowest-wage workers are often the most vulnerable in economic downturns, it often takes them longer to recover in economic expansions. Achieving genuine full employment is one way that low- and moderate-wage workers gain enough bargaining power to increase their wages; employers have to pay more to attract and retain the workers they need when idle workers are scarce. The “lever” for higher wages that comes from full employment is most important for workers at the bottom of the wage distribution: For a given fall in the unemployment rate, wage growth rises more for low-wage workers, and in the absence of stronger labor standards like a strong minimum wage, it is often only in the tightest of labor markets that low-wage workers see stronger wage growth (Bivens and Zipperer 2018). Figure G illustrates how the wages of low-, middle-, and high-wage workers change in response to labor market conditions. Each bar shows the percentage-point change in the growth rate of inflation-adjusted wages following a 1-percentage-point increase in the state-specific unemployment rate, employment-to-population ratio, and prime-age employment to population ratio (among 25- to 54-year-olds), respectively. The blocks of bars show results for the 10th, 50th, and 90th percentiles of wages, corresponding to low-, middle-, and high-wage workers. The results indicate that a 1-percentage-point drop in unemployment results in annual wage growth for workers at the 10th percentile of the wage distribution that is 0.5 percentage points faster. For example, if annual real wage growth is at 1.0 percent, then a 1-percentage-point fall in unemployment would result in annual real wage growth rising to 1.5 percent. For workers near the median of the wage distribution, wage growth is faster by 0.4 percentage points following a 1-percentage-point decline in the unemployment rate. For workers at the 90th percentile of the wage distribution, wage growth is faster by 0.3 percentage points following a 1-percentage-point decline in the unemployment rate. There are similar findings for the other measures of the labor market shown: stronger effects for low- and moderate-wage workers than for the highest-wage workers. What this tells us is that low- and moderate-wage workers do relatively worse in bad times, but also see a relatively larger boost in good times. That alone can explain the recent rise in wages for the lowest-wage and for middle-wage workers over the last few years as shown in Figure F.
Another policy lever was pulled in a number of states over the last few years. In 2018, the minimum wage was increased in 13 states and the District of Columbia through legislation or referendum, and in eight states because the minimum wage is indexed to inflation in those states. And, these changes in state minimum wages came on the heels of other recent changes to minimum wages in many of the same states over the previous couple of years. In fact, when we compare states that have had any minimum wage change since 2013 with states that did not have a minimum wage change during that time, the results—as shown in Figure H—are highly suggestive. Wage growth at the 10th percentile in states with at least one minimum wage increase from 2013 to 2018 was more than 50 percent faster than in states without any minimum wage increases (13.0 percent vs. 8.4 percent). 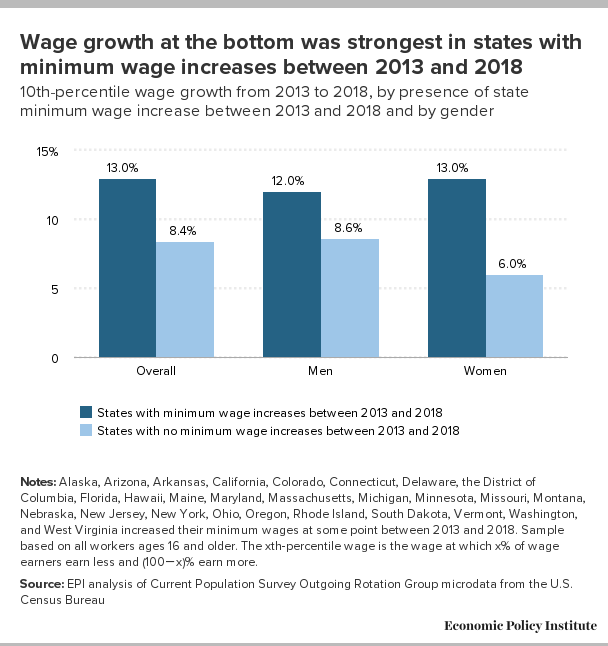 As expected, given women’s lower wages in general, this result is even stronger for women (13.0 percent vs. 6.0 percent), though men also experienced much faster 10th-percentile wage growth in states with minimum wage increases than in those without (12.0 percent vs. 8.6 percent). Notes: Each bar is the coefficient from the regression of the real annual percent change in a given percentile’s wage on the measure of labor market tightness. Regressions include state and year fixed effects. Additional details and estimates are in the appendix. EPOP refers to the employment-to-population ratio; prime-age refers to adults ages 25–54. The xth-percentile wage is the wage at which x% of wage earners earn less and (100−x)% earn more. Notes: Alaska, Arizona, Arkansas, California, Colorado, Connecticut, Delaware, the District of Columbia, Florida, Hawaii, Maine, Maryland, Massachusetts, Michigan, Minnesota, Missouri, Montana, Nebraska, New Jersey, New York, Ohio, Oregon, Rhode Island, South Dakota, Vermont, Washington, and West Virginia increased their minimum wages at some point between 2013 and 2018. Sample based on all workers ages 16 and older. The xth-percentile wage is the wage at which x% of wage earners earn less and (100−x)% earn more. Beyond seeking to keep labor markets tight, policymakers could take other steps to foster strong broad-based wage growth, such as raising the federal minimum wage, expanding eligibility for overtime pay, addressing gender and racial pay disparities, and protecting and strengthening workers’ rights to bargain collectively for higher wages and benefits. Going forward, policymakers should do two things. They should prioritize wage growth by continuing to push toward genuine full employment. And they should provide workers with the leverage to achieve decent wage growth even when the economy is not at full employment by strengthening and enforcing labor standards and making it easier for workers to collectively bargain. The right to collectively bargain is tightly linked to wages and incomes. In fact, the spread of collective bargaining that followed the passage of the National Labor Relations Act in 1935 led to decades of faster and fairer economic growth that persisted until the late 1970s. But since the 1970s, declining unionization has fueled rising inequality and stalled economic progress for the broad American middle class. 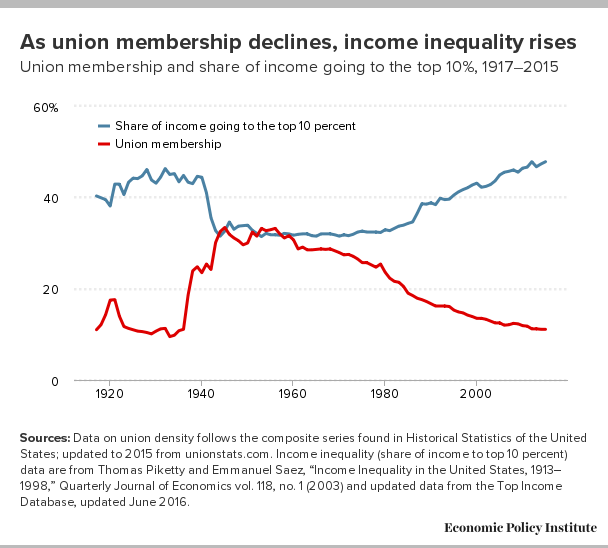 Figure I shows that when unions are weak, the highest incomes go up even more, but when unions are strong, the bottom 90 percent enjoy more income growth. Sources: Data on union density follows the composite series found in Historical Statistics of the United States; updated to 2015 from unionstats.com. Income inequality (share of income to top 10 percent) data are from Thomas Piketty and Emmanuel Saez, “Income Inequality in the United States, 1913–1998,” Quarterly Journal of Economics vol. 118, no. 1 (2003) and updated data from the Top Income Database, updated June 2016. This correlation is no accident. Unions have strong positive effects not only on the wages of union workers but also on the wages of comparable nonunion workers, as unions set standards for entire industries and occupations (Rosenfeld, Denice, and Laird 2016). Further, the union wage boost is largest for low-wage workers and larger at the middle than at the highest wage levels, larger for black and Hispanic workers than for white workers, and larger for those with lower levels of education—wage increases for these groups help narrow wage inequalities. We know how big a force for equality unions are by looking at how much their decline has contributed to inequality between middle- and high-wage workers: union decline can explain one-third of the rise in wage inequality among men and one-fifth of the rise in wage inequality among women from 1973 to 2007. Among men, the erosion of collective bargaining has been the largest single factor driving a wedge between middle- and high-wage workers (Western and Rosenfeld 2011). For a more thorough analysis of how collective bargaining affects worker living standards see How Today’s Unions Help Working People (Bivens et al. 2017). For more policies that will raise wages, see EPI’s Policy Agenda (EPI 2018). Bivens, Josh, Lora Engdahl, Elise Gould, Teresa Kroeger, Celine McNicholas, Lawrence Mishel, Zane Mokhiber, Heidi Shierholz, Marni von Wilpert, Valerie Wilson, and Ben Zipperer. 2017. How Today’s Unions Help Working People: Giving Workers the Power to Improve Their Jobs and Unrig the Economy. Economic Policy Institute, August 2017. Bivens, Josh, Elise Gould, Lawrence Mishel, and Heidi Shierholz. 2014. Raising America’s Pay: Why It’s Our Central Economic Policy Challenge. Economic Policy Institute, Briefing Paper No. 378, June 2014. Bivens, Josh, and Ben Zipperer. 2018. The Importance of Locking in Full Employment for the Long Haul. Economic Policy Institute, August 2018. Economic Policy Institute (EPI). 2018. Policy Agenda. December 2018. Gould, Elise. 2019a. State of Working America Wages 2018: Wage Inequality Marches On—and Is Even Threatening Data Reliability. Economic policy Institute, February 2019. Gould, Elise. 2019b. 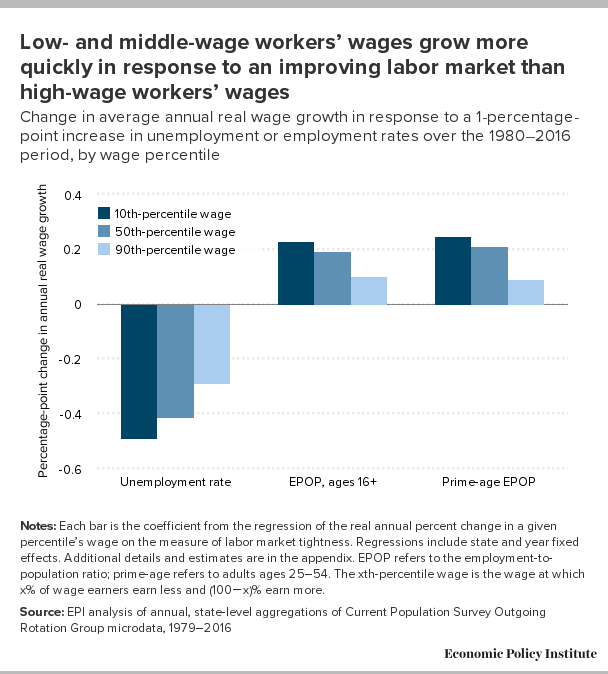 “Stark Black–white Divide in Wages Is Widening Further.” Working Economics (Economic Policy Institute blog), February 27, 2019. Gould, Elise. 2019c. 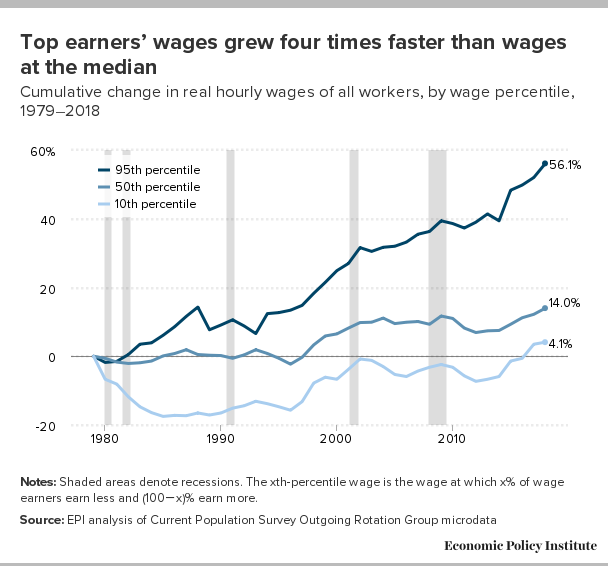 “Higher Returns on Education Can’t Explain Growing Wage Inequality.” Working Economics (Economic Policy Institute blog), March 15, 2019. Mishel, Lawrence, and Julia Wolfe. 2018. 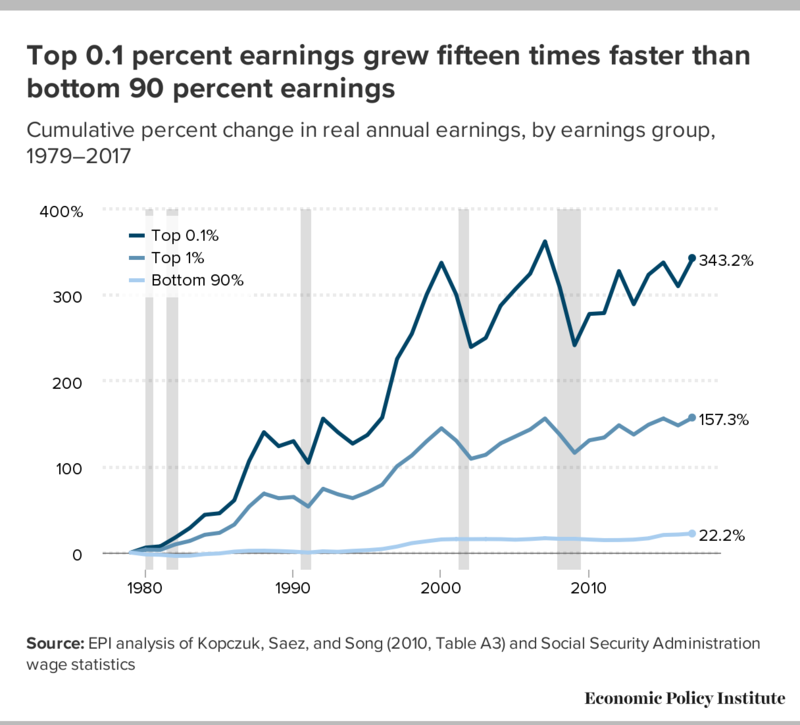 “Top 1.0 Percent Reaches Highest Wages Ever—Up 157 Percent Since 1979.” Working Economics (Economic Policy Institute blog), October 18, 2018. Rosenfeld, Jake, Patrick Denice, and Jennifer Laird. 2016. Union Decline Lowers Wages of Nonunion Workers: The Overlooked Reason Why Wages Are Stuck and Inequality Is Growing. Economic Policy Institute, August 2016. Western, Bruce, and Jake Rosenfeld, “Unions, Norms, and the Rise in U.S. Wage Inequality,” American Sociological Review vol. 76 (2011), 513–37.